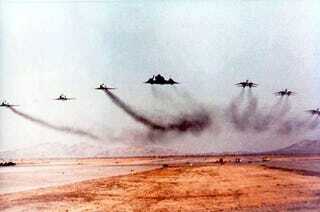 This has to be one of the coolest and the LOUDEST military aviation photos in history. No less than three Tomcats and three Phantoms are headed by an SR-71 Blackbird as they pour on the coals during a high-speed, low-level flyby over NAWS China Lake. The circumstances of how this shot came to be remain a mystery, but I would like to thank it happened because it simply had to.